Introduction. Laparoscopic splenectomy is now considered the gold standard for removal of the spleen in several hematologic diseases. Adequate intraoperative occlusion of the splenic hilum vessels is the main important step to reduce intraoperative bleeding during the procedure. This is especially true in cases where there is a different splenic hilum, like in patients with hilar lymphoadenopathy associated with splenic lymphoma. In this paper, we report our results using the endosurgical stapler for hilum vessels control. Patients and methods. Data collected from 102 patients operated on with laparoscopic splenectomy has been reviewed retrospectively. Indications for splenectomy was idiopathic thrombocytopenic purpura (ITP) , hereditary spherocitosis, beta-talassemia, myelofibrosis, splenic cyst, splenic mycosis- Control of the splenic hilum vessels has been accomplished in every cases by the use of an endosurgical stapler. Results. Intraoperative or postoperative bleedings requiring conversion to open surgery or reoperation have been reported in 4 cases (2 intraoperatively and 2 postoperatively). In 2 cases the bleeders were the short gastric vessels. In only 2 cases bleeding came from the splenic hilum in patients with hilar lymphoadenopathy. Discussion and conclusions. 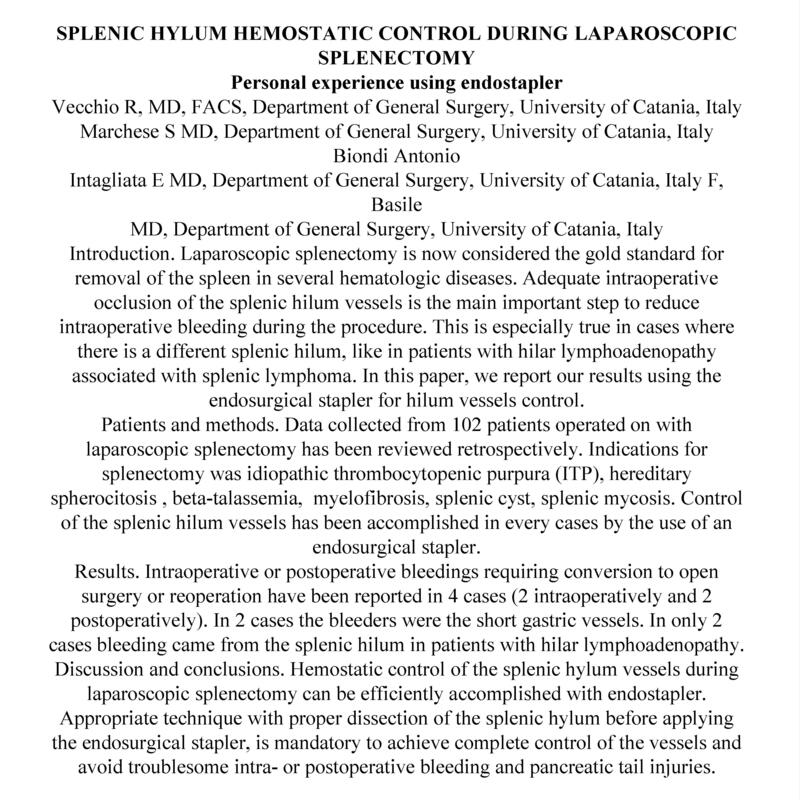 Hemostatic control of the splenic hylum vessels during laparoscopic splenectomy can be efficiently accomplished with endostapler. Appropriate technique with proper dissection of the splenic hylum before applying the endosurgical stapler, is mandatory to achieve complete control of the vessels and avoid troublesome intra- or postoperative bleeding and pancreatic tail injuries.